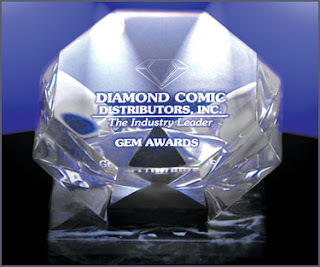 Diamond announced their 2009 Gem Award-winners today, and PARKER: THE HUNTER won the Gemmie* award for Original Graphic Novel of the Year. This was our first year being moved up to the Publisher of the Year (over 4%) category, which is a nice honor, even though we were technically right at 4% for 2009 and likely should've still played in the "...Under 4%" category that we've won five out of the last six years. But still, any time we're now considered competition to Marvel and DC is a sign of respect. *The Title of this blog is a nod to Pearl Jam's "Gremmie Out of Control," in case anyone was wondering. Congratulations, to IDW and Darwyn Cooke!